Former senior Ulster Unionist Lord Kilclooney has clarified a tweet in which he claimed unionists and nationalists are not political equals. The cross-bench peer's comment made the front page of the Irish News on Thursday. He told BBC Radio Ulster's Talkback programme he was "a firm supporter of equal opportunity for everyone". However he was criticised by Sinn Féin MLA Máirtín Ó Muilleoir. Mr Ó Muilleoir said: "If I am not misinterpreting him really what he is saying is that we (nationalists) will have to stay at the back of the bus." 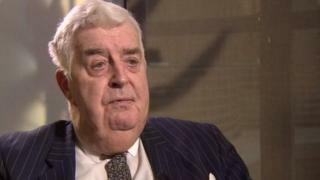 Lord Kilclooney told Talkback on Thursday it was "very important" that Northern Ireland offered "equal opportunities for everyone, whether they are Irish or British, nationalist or unionist, Catholic or Protestant". "Equal opportunity is essential for everyone," he added. "But when it comes to equality that is a different issue, in political terms, in democratic terms, the pro-united Ireland vote is not equal to the pro-United Kingdom vote. "In the last Stormont election, 44% voted for a united Ireland, 56% did not. "It is not equality in political terms, but certainly we are equal in individual terms. "What I mean by equality is that each individual irrespective of his politics or his religion has an equal opportunity in our society to get a job, to get a house, to live a free life." Lord Kilclooney, a former deputy leader of the Ulster Unionist Party, was a key negotiator in the Good Friday Agreement. He said he was a supporter of equality of opportunity for everyone including Irish language speakers, but that it was important to know the content of any proposed Irish language act. "I think Irish is more important than the question of speaking it, after all more people speak Chinese or Polish in Northern Ireland than speak Irish," he said. "It is not a question of who speaks it, it is a question of where it belongs and the Irish language is an old language in Ireland and we have a duty to preserve it, but it depends how you do that. "I think we are doing it very well in Northern Ireland in the way we finance and encourage the teaching of Irish throughout the schools. "We have got to spell out what is in this Irish language act." Earlier this week, Sinn Féin President Gerry Adams said there would not be an Assembly without an Irish language act. Mr Ó Muilleoir said he believed that "within the broad unionist community the argument has been won" for an Irish language act and "now we are having to outwork it". He said the challenge for the party's "unionist partners" was whether they could accept that. "The question I can't get a straight answer from unionists on is how can this be good enough in Scotland, good enough in Wales, good enough in the rest of the country but not good enough here," he added.